I came across this word in this YouTube video (queued to example) and was curious about the origin. 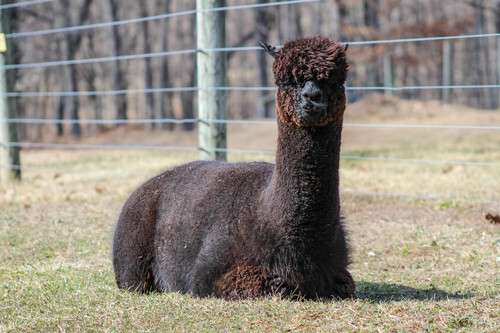 Example image of an alpaca kushing. I can't find the definition as defined in the linked image in any dictionary. I tried a general Google search and various print dictionaries, including an (albeit dated) unabridged Oxford and a couple of (again, dated) American dictionaries. Surprisingly, the word did not appear at all in the Oxford. The best I got was this alpaca breeding website. It's described as a way of sitting either to keep warm or for females receptive to breeding. But none of the definitions I found related to that at all. The definitions I did find most often were in regards to the biblical son of Ham (who was the son of Noah) and a region of Africa (possibly) named after him. For slang, it's another word for "money" and a type/preparation of marijuana similar to hashish. Kushing (or cushing or kooshing) is an awkward activity, because llamas only have two knees in the front and no knees in the back. Their back legs are joined at the hips! Kush may derive from the sound of a command, probably from the French "couche" that is "lie down". The term for the act of a llama laying down sternally or the actual position a llama is in when it is laying down. It may also be used as a command to get a llama to attain this position. "Kush" is a word used with camels to tell them to lie down. I'm sure it comes from the French "couche", but it rhymes with "push".